Nancy is an open-source .NET web framework or, if you prefer, designed to support the development of web applications, like web services, web resources, as well as web APIs. Sounds better now, don’t you think? Ok, but what makes it different than all the already existing frameworks, successfully used for years? Well, except the name – which, by the way, is this specific one because it’s modelled on the Ruby web framework “Sinatra”, so the developers wanted to pay a tribute to the famous singer by using his daughter’s name – it’s made not for what users see when checking out a web application, but for what happens behind the desk, in the back end. And this exactly what the Nancy framework does: provides developers with a toolkit so they can examine the backend code of an application. It was also one of the first solutions used to produce HTTP-based APIs, being present on the market ever since 2010, when the project’s first commit was checked into GitHub. So, considering that it’s been around for a while, there’s one question any developer who hears about the Nancy framework for the first time has: can it still be properly used in software development today? Why of course it can! The framework reached a point in which it’s stable enough and allows creating first-class HTTP-based interfaces, no matter the project. Also, the beauty of Nancy lies in the fact that if you want to build a web application, you don’t need to use both HMTL and CSS in your browser or have a web server running in the background. 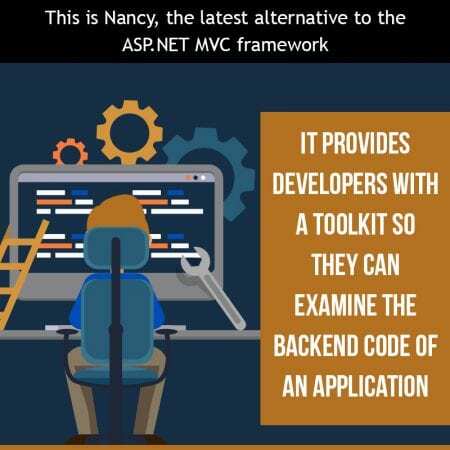 Simply put, you can embed the Nancy framework into a classic ASP.NET-based web application or even use it directly with .NET core. But the main advantage is that you can add it into pretty much any .NET-based project in which you have a use case. And this is not everything since the framework has an incredibly big number of use cases which other tools, like ASP.NET MVC, for example, can’t cover. Also, due to its quite staggering amount of functionality, Nancy can be used under the Mono Framework for running apps and services on both Linux and Mac devices. If you’re ok with jumping through a few configuration steps, you can also use it with the newer .NET Core framework with no problems at all. Oh, and there’s one more aspect that needs mentioning: an entire community was built around it, always ready to help you with any issue you might have. If you want to start developing web apps in a significantly easier way, the Nancy framework is definitely an option to consider! On the other side, no matter how easy to use this sounds, you may lack the resources – including time – to develop your own website or web apps based on Nancy. IB Systems can assist you with the entire process, thanks to an experienced team with a solid background in working with such frameworks. If quality is what you’re after, they are the ones to work with.